The Gardens Team visited 6 gardens, the only existing successful gardens in C-Section of Monwabisi Park. 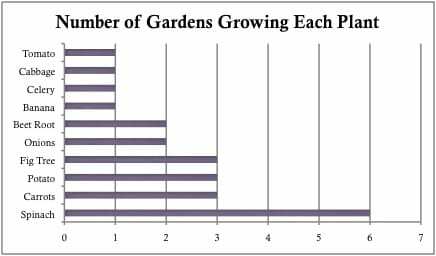 We toured these gardens with the guidance of co-researchers. The following is a summary of our findings through our field observations. 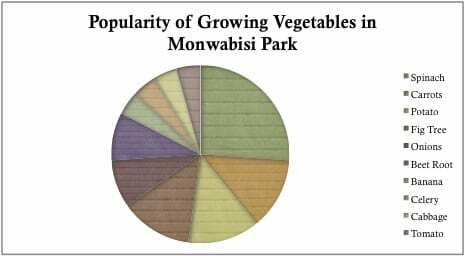 Below is a pie chart of the vegetables grown in Monwabisi Park. It seemed spinach was the easiest plant to grow; even some community members without formal gardens had a few spinach plants lining their shacks. The following is another summary of the plants grown in Monwabisi Park, this table includes plants grown in “unoffcial” gardens, such as, the spinach lining the shacks.